Kimberley Bugg joined Falvey at the end of November as the Information and Research Assistance team leader, replacing Jacqueline (Jackie) Mirabile who retired last spring. Kimberley will be responsible for training and scheduling the library information staff who are available during most hours when the Library is open. Information staff provide basic assistance in the use of library resources and refer questions to research consultation librarians when additional assistance is needed. Falvey maintains a 10,000 volume print reference collection of general and subject specific sources as well as over 350 online reference sources. In addition it provides access to more than 250 indexing, abstracting and full-text databases available on the Web. The IRA team provides assistance in using these print and online sources. 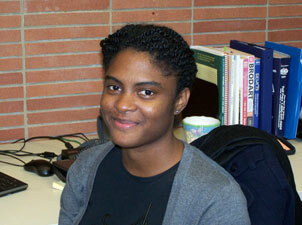 Kimberley, a native of Atlanta, comes to Villanova University from Queensborough Community College, City University of New York, where she was emerging technologies coordinator. Previously she had been the assistant head of information and research services at Robert W. Woodruff Library in the Atlanta University Center. She has a bachelor’s degree in communication and accounting from Georgia State University, Atlanta; a master’s degree in library science from North Carolina Central University, Durham, N.C.; and a master of liberal arts degree from Clayton State University, Morrow, Ga. Her hobbies are reading, watching reality television, eating and yoga.